The £673m One Nine Elms development, currently under construction in the London borough of Wandsworth, will feature two of the tallest residential towers in Europe, the 56-storey City Tower and a separate 42-storey River Tower, connected by a glazed bridge. The scheme will include 494 residential units, mostly luxury private apartments, with some affordable housing, and a five-star hotel occupying the bottom 18 floors of the River Tower. 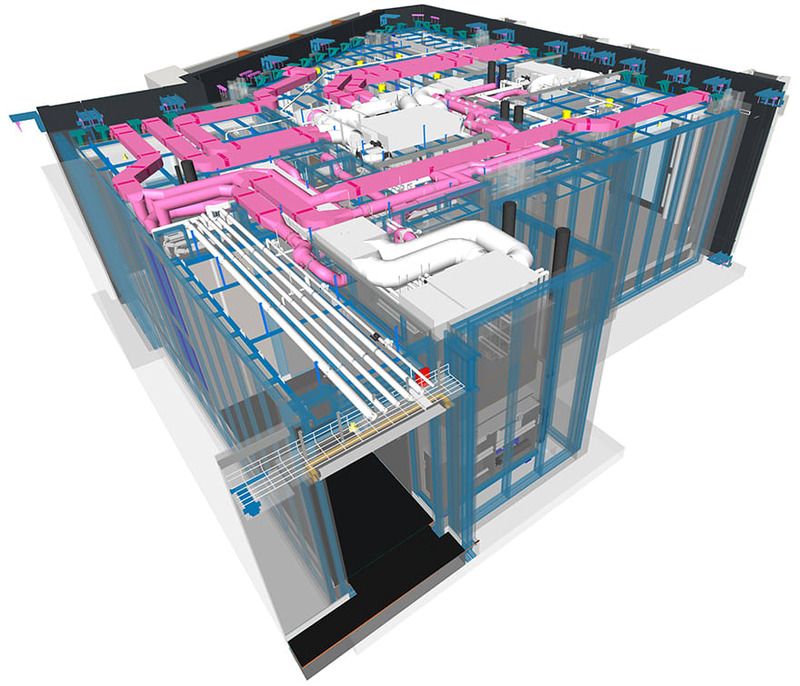 The high-profile nature of the development, with stringent demands on quality, and a large amount of repeatability, prompted Multiplex to contract design practice One Creative Environments to develop a detailed virtual mock-up for the project in BIM to iron out any potential issues before going to site. Construction teams on residential projects typically create full-scale physical mock-ups of key apartment types to enable the design and client team to inspect quality, and for contractors to resolve coordination issues ahead of the build. However, mock-ups can be very costly (typically over £1m), take months to build and require multiple alterations and iterations to resolve coordination issues, all while the construction programme advances. To address these concerns, One Creative Environments worked with Multiplex to develop a virtual mock-up of one key apartment and corridor much earlier in the build, designed to speed up coordination and clash resolution and deliver a range of other benefits. 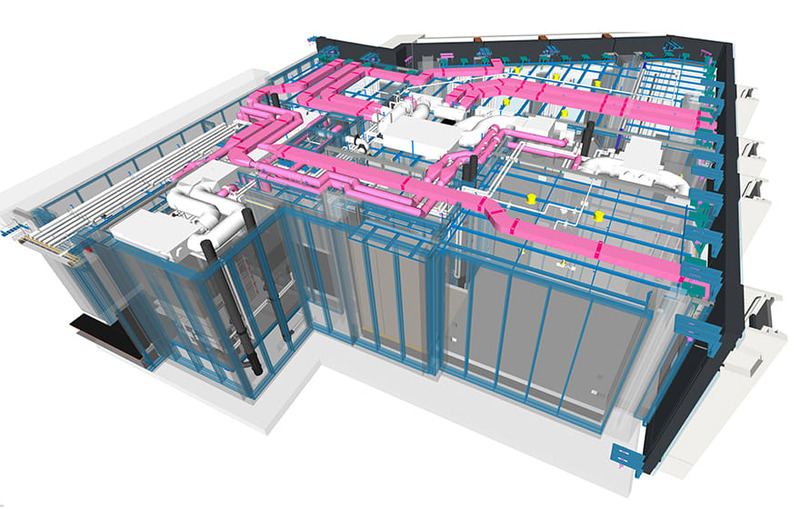 The virtual mock-up was developed to LOD350/LOD400, including all MEP services, and went beyond traditional “hard clash” detection to identify several “soft clashes” such as door swings and the impact of switching out replaceable equipment, such as filters. Critical MEPH equipment that requires regular maintenance was found to be inaccessible. In addition, access panels, doors and some kitchen equipment were identified as unopenable and resolved. “Issues like these are only typically discovered on site or at the point of operation, when it is disruptive and costly to put right,” says Whittall. Development of the mock-up began with a bespoke Model Element Table, based on the BIMForum’s BIM LOD Specification, and subsequently enhanced to ensure that critical elements were captured in sufficient detail. The Level of Information was also developed to include additional bespoke parameters required to link the virtual mock-up to 4D and 5D software packages later in the process. Required outcomes from a coordination issues report were set out to show precisely what had been resolved, what had to be recorded and the further design responsibilities of different project stakeholders. The report highlighted elements that had to be adapted or modified to improve coordination, plus those that required further input from the supply chain/design team to provide a workable solution in the final build. This proved critical when checking the installation of the bathroom pod which had to interface with in-situ components, such as drainage and services connections. Implementation of the virtual mock-up resulted in several other benefits on the project. The model was delivered within three months, significantly faster than a physical mock-up apartment and at a fraction of the cost. The coordination issues report evolved to become a “project checklist”, highlighting issues that required further input from the client and or design team, or issues that specialists need to be aware of to construct safely/efficiently when they are appointed to the project. Thorough understanding of all outstanding issues is expected to help supply chain contractors reduce their perceived risk and price accordingly. The process is also expected to enable Multiplex to save time and effort on site, resolving issues in the virtual space rather than dealing with them on site. However, Whittall notes that a virtual mock-up offers one disadvantage to a physical mock-up - you can’t touch and “experience” the quality of the build. “We plan to address this on our next job where we will be using virtual reality to allow the client to experience the model 1-to-1 and look more in depth at quality issues,” he concludes. The One Nine Elms Virtual Mockup was awarded Project Innovation of the Year 2018 at the inaugural Digital Construction Awards in October 2018.